3 Resolutions to Make 2016 the Best Year Yet! By ussnemoadmin Best Seafood Restaurant, Seafood Restaurant Comments Off on 3 Resolutions to Make 2016 the Best Year Yet! Happy New Year! All of us at USS Nemo are excited about 2016. We look forward to another stellar year of growth and serving our customers the finest seafood in Naples, FL. Nothing is more satisfying than serving delicious, gourmet seafood dishes to satisfied customers. That is what defined 2015 for Nemo restaurant, and that is what we intend to do in 2016 – only more so! As the year gets underway, Nemo restaurant has its own set of resolutions. We’re absolutely determined to follow them, and you, the customer, will be the greatest beneficiary! Here are some resolutions for 2016 from one of the best restaurants in Naples, FL. Everything from the gourmet menu items to the international wine and cocktail lists have been developed with love and precision. 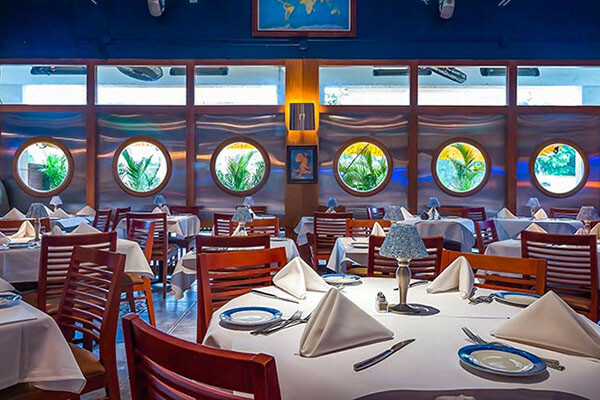 Even the decorations in Nemo restaurant are deliberate; the intricately decorated interior of the restaurant has been carefully crafted to give the sensation of being in a luxury submarine. This degree of excellence doesn’t come easily. It takes work to be one of the best seafood restaurants in Naples. Take, for example, our recent battle with, and victory over, one of our signature dishes: our famous miso-broiled fish. It took months to develop the perfect recipe for our famous miso-broiled fish. Executive chef Nicolas Mercier had a vision for this dish. He knew how it should look, taste, and feel. The trouble was, the dish just would not come out the way he envisioned it. It was not bad; it just was not good enough for the best restaurants in Naples. It stayed off the menu. Chef Nicolas would not give up. Then, one time while preparing the dish, he accidentally switched the amounts of two of its ingredients, and voila! The dish was just as he’d imagined it, and worthy of being placed on the menu. It is now known as Nemo’s famous miso-broiled fish, available with sea bass or salmon. The dish has a citrus-ginger butter sauce and comes with steamed rice, asparagus, and carrot tempura. Nemos knows customers come first, and we support your 2016 resolutions! If you are trying to eat healthy, local, and fresh, we have the dishes for you. Seafood is lean, high in protein, and packed with essential nutrients and healthy omega-3 fats. If you want to enjoy life, there’s no better choice than a fine dining experience at the best seafood restaurants in Naples. If you want to spend more quality time with friends and family, take advantage of our lunch and dinner menus ranging from fancy dishes to classic favorites for our younger friends. Fine dining is a matter of passion. Customers need to feel that passion every time they visit the best restaurants in Naples. In 2016, USS Nemo will strive to let passion shine through. These are some of the ways we hold ourselves to the highest standards of cooking and service. Only the best recipes appear on the menu. All recipes will be tried and corrected until we are confident they are ready. Only the finest ingredients will be used. They are always fresh, and sourced locally when possible. If we cannot obtain the best ingredient, the dish will not be on the menu! Customer service is taken to a new level. You will know your greeting is sincere, and can enjoy our servers’ expert advice on wine pairings and dishes to try based on your likes and dislikes. Again, Happy New Year from all of us at USS Nemo! Together, let’s make 2016 the best year yet!